Rings are one of the “must have” items for every instructor’s toolkit! There are 1001 things you can do with rings, and more. This is just a short list of games I’ve come across, and with a little imagination I’m sure you’ll come up with more. Please add to the list by posting in the comment section! 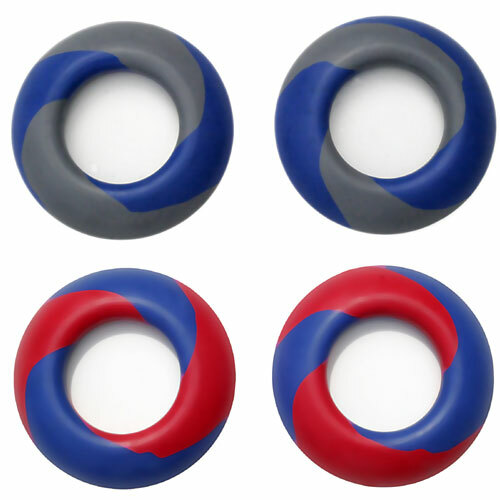 Solid Rubber Rings – Those shown above are from freedomrider.com. 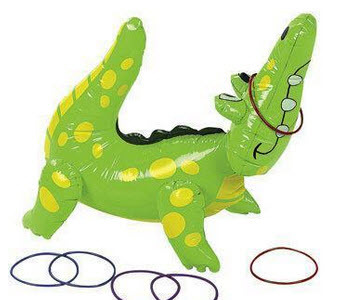 Or you can get pool diving rings from Walmart, Target, etc. Nubby Rings – the above “Sensa Rings” are from freedomrider.com. 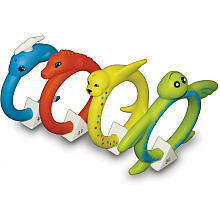 Animal Rings – I’m sure little kids would love these “Soft Dive Animal Rings” from Toys R Us! I do! Quoits – from the game “Quoits” (Wikipedia definition here), these are heavier, rubber, don’t bounce easily, and the edges don’t wear down easily; the above are from the quoitfactory.com. Smooth rings for sensory sensitive kids. Nubby rings for sensory sensitive kids with whom you are working on increasing sensory input. Nubby rings for kids with short attention spans, self stimulating behaviors, or that always have to be moving, because increased proprioceptive input should increase engagement – aka it gives their hands something to do and brings their attention back to what they’re doing. Both types for added variety, when it doesn’t matter, or for kids that need added help differentiating between items (pink smooth ring vs. blue nubby ring is more different than if they were both smooth). Whichever type motivates the kid best! Student gets a ring from the instructor, the ring tree, hooks on the arena, hanging on the arena letters, hanging on arena fence posts, etc. This practices woah, walk on, stretching, problem solving (“Hm, you can’t reach the ring, what should you do?”), word usage (“Would you please hand me the ring?”), and manners (“Please” and “Thank You”). Student tosses the ring onto the cone, onto a cone of the same color, into a hoop, onto an alligator*, etc. This practices precision woahing, sequencing, matching (ring to cone if you choose this route), and hand/eye coordination. Add difficulty by removing the stop, having them toss on the go while steering with one hand! To make it easier, or raise the cones using barrels or crates, which allows the student to place the rings on the cones instead of tossing. This offers certain students more opportunities success if they are not successful at making the ring toss. Later you can lower the cones to the ground for added difficulty. *Did I say alligator? How fun would this be, from bonanza.com!? 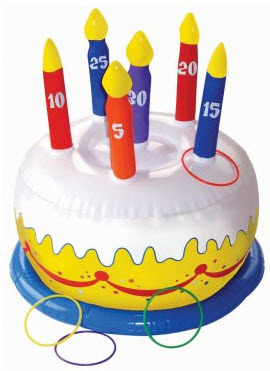 Or how about breaking out the Birthday Ring toss for a student’s birthday from birthdayexpress.com?! From reader Nan’s compilation of “Games & Activities on Horseback for Beginner & Nervous Riders” 2009. Thanks Nan! Give riders 6 colored rings. 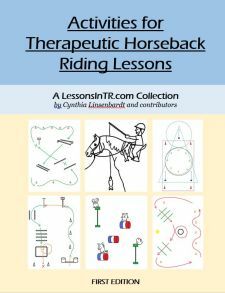 Give riders a sequence to deliver the rings to the cones. Or give riders a specific path to ride, like down the center line. This works on precision woahing, hand eye coordination, and stretching. Place vertical poles in arena (I prefer down the quarter line, becase then you can use them as weaving poles too – or if you place them all over the arena you can play avoiding poles). Give student a ring and have them put it on on a pole. You can have the rings’ colors coordinate with the poles’ colors to work on matching, or number each pole to work on numbers, or tell them which pole to work on memory, etc. This is great for working on stretching and hand/eye coording. If the kid stops too far from the pole it’s easy to tilt close to them (or for added difficulty make them reposition their horse closer), or you can tilt the pole further away for a good stretch! From reader Nan’s compilation of “Games & Activities on Horseback for Beginner & Nervous Riders” 2009. Thanks again Nan! Works on stretching, hand/eye coordination, following instruction, woah and walk on, etc. Have students steer to “joust” the ring off the pole”, and bring it back to the instructor. For progression, have them halt for each “joust”, then move up to walking, and even trotting. For added difficulty, have them switch hands! This works on stretching, balance, eye/hand coordination, steering, control, etc. Have sets of rings that match colors. Hide one set around the area – on letter, posts, obstacles, a volunteer,etc. You keep the matching set. Have the student pick a ring from your matching set – you can hold them, put them in a bucket, hang them on a ring tree, etc. Have the student put the ring they picked on their wrist, go find the matching ring, and bring it back to you. This works on steering, control, precision woahing, asking for help, matching, manners, etc. Place a ring on each student’s foot. Have them ride without it falling off! This works on toes up and heels down, and body awareness. For added difficulty, have them complete an obstacle course or trot! Those are just 7 of 1001 ring games that I know are out there, so please share some of your own! Where do you buy rings? Which kind do you use for which kids? What ring games do you play? Thank you so much for your advice and information. I am doing my intern teaching right now and sometimes I am just overwhelmed. I have three different mentors, all are great in their own way and I am learning a lot. I just feel like I have never taught before in my life at times!! 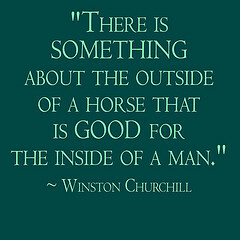 !…this coming from somebody that has competed and taught pony clubbers & 4-Hers. I totally appreciate everything you have offered here at this site!! Thanks for your note! I love hearing that this site is doing what it was intended to. And I know how you feel, I thought with my own teaching experience it would be easy, but getting certified was actually one of the hardest and humbling and overwhelming things I’ve ever done. I kept thinking about that song “What doesn’t kill you makes you stronger”, and I had to agree, doing this will only make you a stronger person and better, safer teacher. Good luck! Love all of your ideas!! Wish there were more blogs like this!! Cool ideas, keep it up!